SAFETY ACT CONSULTANTS was formed to help organizations understand their terrorism liability exposures and the financial impact they could have on an organization. We help educate clients on the various financial mitigation strategies and options to protect their bottom line including insurance and risk transfer as well as the Federal statutory protections available to them under the SAFETY Act. 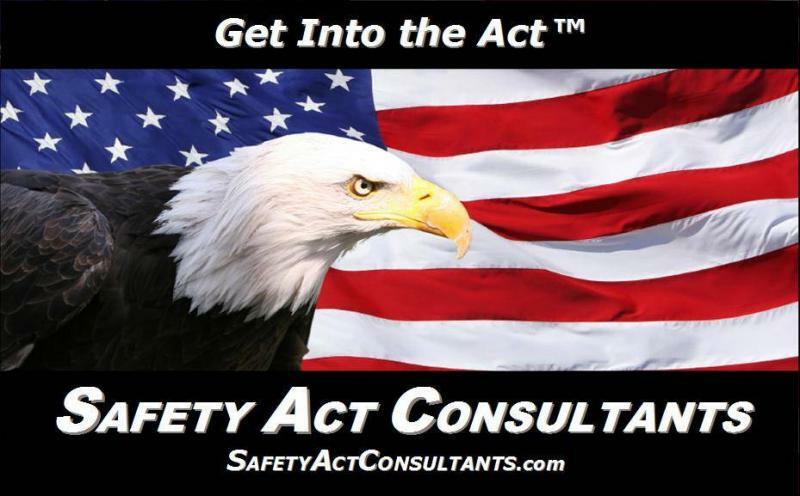 We help organizations in all business sectors benefit under SAFETY Act and, if appropriate for their terrorism related exposures, strategies or products, we help them successfully navigate through the DHS SAFETY Act application process. The SAFETY Act does not require you to apply to obtain significant liability protection under this law. Let us show you how! We pride ourselves in offering our clients a Total SAFETY Act Solution - From start to finish and then some. This includes advice on the modifications needed to your contracts and insurance program to assure compliance and protection. This critical step is often overlooked by many applicants. It assures you the best protection possible and that SAFETY Act, your contracts and your insurance will respond as expected. Last minute surprises here are rarely, if ever, good news. We also help clients use the SAFETY Act as a true product differentiator allowing better marketing opportunities, generating new product interest and improve revenues. We represent clients of all sizes from small business startups to Fortune 100 companies. Some have built their entire company around one “hard box” technology or software program while others have multiple anti-terrorism service and technology integrations with many elements involved. We will quickly become one of your trusted and invaluable strategic business partners. We will work closely with your staff and business units to free up as much executive time as possible. We will also work closely with your other business partners as necessary to assure a timely and seamless approval process with the Department of Homeland Security. These could include suppliers, marketing, production and engineering firms, subcontractors, vendors, customers as well as outside counsel, insurance carriers and brokers. We can help you prioritize multiple applications based on your needs, ease of DHS approval and the exposure to loss that each one represents. We can help you decide on how best to apply for SAFETY Act protection. Experience tells us that many times it is quicker and easier to get multiple applications approved than one overall application for the integration of many technologies and services. As an example, if facility access incorporates multiple elements such as metal detection, security guards to review ID and search bags, chemical trace detectors and separate ID / e-card / RFID / biometric access control for sensitive areas, it may be more expedient to apply for each one separately. A failing grade on any one element of an application will cause disapproval of the entire application. There is no appeal process under SAFETY Act once an application is denied. As independent consultants, we avoid the inherent conflicts faced by other organizations – We work closely with you on saving money rather than selling expensive services, products and/or insurance that may be unnecessary. Although we are a full service SAFETY Act consulting group, to utilize our services, we do not have to perform all of the many SAFETY Act processes required for a successful application. We can manage your entire SAFETY Act strategy and application process or review and advise you on only one element of an application or SAFETY Act requirement based on your needs. We often consult organizations on specific "pieces" of information such as internal training on SAFETY Act to management, legal, risk management or technical staff. We are experts on the insurance coverage required under the legislation and how to best provide maximum protection and minimize costs. We can help you understand how to define and group "technologies" for one application, provide overviews of the protections afforded under the law and help you use the SAFETY Act to market your products. We frequently utilize formal and informal business partnerships and relationships to provide our clients with the best and most cost effective services, advice and solutions possible. The use of a technical, legal, local or other partnership arrangement when needed actually reduces the cost to you. We will always inform you who we recommend and will only use them upon your specific approval in advance. Our contractual relationship with you including the fee(s) agreed upon, fully contemplate and incorporate these relationships unless otherwise described in writing and in advance. As stated above, DHS required insurance is a key area that MUST be looked at closely for all your applications and approvals whether prior, currently in process or that may be made in the future. It is not a difficult to modification but it must be done to assure protection under SAFETY Act and your insurance program. Do your sales agreements "align" with how the SAFETY Act will be applied and interpreted in court? How about leases, procurements, vendor agreements or other contracts? This is another very important element of SAFETY Act approval that must be addressed. Again, not difficult, but another must do item to avoid some very unpleasant surprises later. We frequently see contractual language that can potentially "undo"
or nullify many of the benefits that SAFETY Act provides for both you and the other parties to the contract. We can also provide advice and ideas on other terrorism related financial protection strategies outside of SAFETY Act. These strategies can help protect you against things such as NBCR risks (nuclear, biological, chemical or radiological risks), property coverage, business income interruption, supply chain interruption, maintaining corporate image / reputation and other adverse impacts a terrorist event will cause. We work closely with companies and entities in multiple industries including aerospace, energy, chemical, utilities, major real estate owners & developers, financial institutions, manufacturers, information technology, hospitality and gaming in identifying terrorism related exposures and providing liability and financial impact mitigation strategies, options and solutions. We combine industry knowledge with highly specialized expertise in creative and innovative strategies and solutions to successfully manage the financial risk that can stem from a terrorism event. We consult organizations on the integration of multiple strategies that can include traditional risk transfer, non-traditional risk transfer, captive and rent-a-captive utilization, accessing protection through existing statutory / legislative means including the Homeland Security Act, SAFETY Act and The Terrorism Risk Insurance Act or “TRIA”, the Government Contractor Defense / "Boyle" and PL 85-804. Transportation including Rail, Marine, Over- road, Aviation etc.